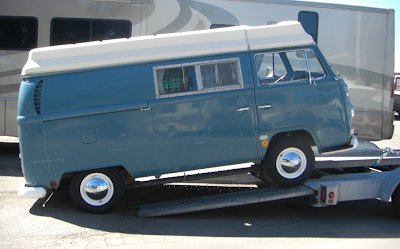 I spent most of my day on Sunday moving Blue Blue from Redwood City up to Valley Wagon Works in San Rafael. It involved driving to Fremont in the East Bay to pick up a Budget truck and car trailer from Tao at the Budget Truck there. From there, I drove the truck to Redwood City, inched Big Blue onto the trailer using a come-along. And then drove at about 45 mph all the way through San Francisco to the Golden Gate Bridge and then into Sausalito. 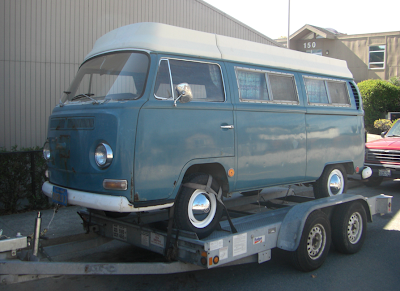 I picked up EP in Sausalito, and we got our first VW wave from another Bay Window model VW as we got back onto the 101 headed to Valley Wagonworks in San Rafael. Luckly, Paul was there working so he started it up and drove it off the trailer for me and will commence work this week. Up first is fixing the ignition, new master cylinder for the brakes and a new fuel line. 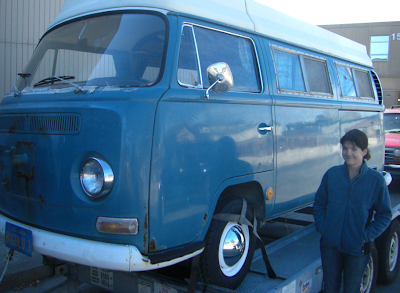 Also, Monty, the previous owner of Big Blue, is looking around for some old photos and he sent an email out to the old Big Blue crew for some stories and pictures. I am looking forward to getting more of the history from Monty as it seems Big Blue has tons of untold stories in him. Thanks for the help, Monty. Here is stop action video of it going on the trailer and some pics after.